There are some things that happen in world military affairs that only I get upset about, and this is probably one of those things. 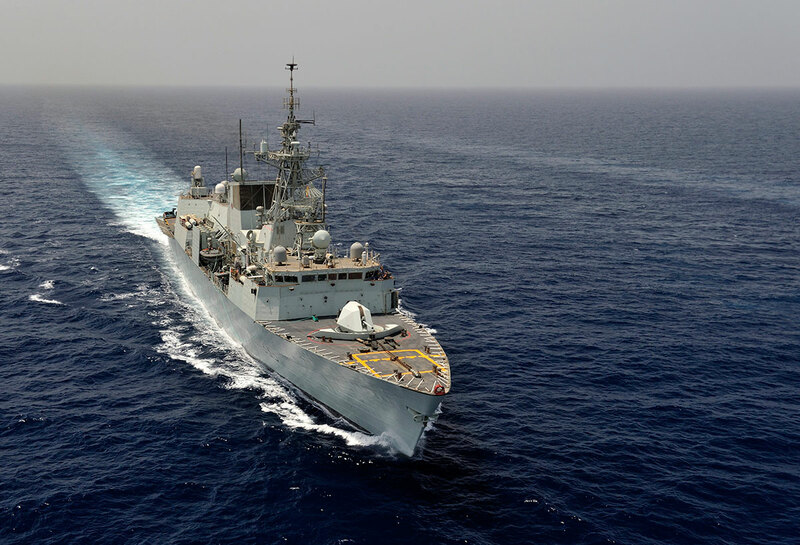 According to their AIS transponder, HMCS Toronto departed 2019-01-21 ~11:45Z from CFB Halifax for a six month tour with NATO Standing NATO Maritime Group Two (#SNMG2), and unlike previous Royal Canadian Navy-NATO deployments (like HMCS St Johns), HMCS Toronto has been operating with their AIS transponder off the whole time, for months.. until they entered the Black Sea and seem to have started broadcasting the MMSI of the HMCS Charlottetown. In some form or fashion, whatever had been entered manually into the transponder was not as it should be - but I don't know how it happened. From my seat here in Ottawa, one of my windows to the deployed maritime world is MarineTraffic.com, which has a worldwide network of AIS receivers. Along the way, in the Black Sea (and now in the Med), HMCS Toronto has been near many of those receivers, and I was able to put them on a map to illustrate where they were. Each place where they were broadcasting their location using AIS was being heard by not just the MarineTraffic.com receivers when they were close to shore, by design they were being "heard" by any ship, including Russian Navy SIGINT vessels in the area, without going through MarineTraffic.com. I mention this to make sure you have at the forefront of your mind that the HMCS Toronto itself is broadcasting their precise location, over marine VHF, and through the miracle of technology, are transmitting that location to everyone around the world; it isn't just Russian AGIs that know where the HMCS Toronto is - and that's not a problem or cause for concern! The commander of SNMG2, Commodore Boudewijn Boots of the Royal Netherlands Navy, engages with the public over social media, bringing pictures from the bridge to Twitter, letting you know where they are regularly; so I have absolutely no doubt the location of the ships is in no way a "secret", and revealing the location of HMCS Toronto is in no way compromising their security - they are broadcasting their location themselves, but are showing up on MarineTraffic.com as using the identification number (MMSI) of the HMCS Charottetown. Are they trying to impersonate HMCS Charlottetown? What happened? There are many Twitter accounts that are not operated by individuals, and are actually detractors put there to hijack the conversation and mislead the public; that said, I haven't given up on the platform yet, even though its extremely difficult to tell the difference between outraged soccer moms and paid disinformation operatives conducting their affairs in bad faith. One inventive answer is that it was a prank or otherwise inside joke among the comms operators on the HMCS Toronto referencing when HMCS Charlottetown was performing exercises near Florida and labelled itself a "Pleasure Craft" (rather than a warship) over it's AIS transponder. I'm not convinced that's the case. I always appreciate messages from people who may know something but can't tell me anything because I don't have a need to know; "There are things at play here that are beyond the letter of the book." Okay, that's almost Yoda-worthy. We also have at least two organisations' standard operating procedures in competition with each other, along with the personal views of the commanding officier (Cdr Martin Fluet), the commander of SNMG2, NATO itself, and the Royal Canadian Navy. Something changed, and I don't know who gave what orders to whom. I was not paying any attention to HMCS Toronto's movements, because after they left Halifax and turned off their transponder, I didn't expect to see them for six months. When they departed the Black Sea, and I noticed they were using the MMSI assigned to the HMCS Charlottetown, I was quite surprised. You'll remember they were the ones who lost power / caught fire / broke down off the coast of Scotland and we were able to track them as they were limping around. Maybe they decided that was too transparent, and have gone in the other direction? The problem with that mentality is the underlying reason to turn off their transponder; to avoid public scrutiny, not t avoid the Russian Navy - who I'll guess are the primary adversary when conducting European war games. The Russians have their own national technical means to monitor and track NATO ships; and AIS, used by commercial ships the world over to avoid collisions, is not their primary method to detect or monitor #NATO ships. Does it help? Sure, everything helps, I'll give you that. If the Russians think the USS Ross is at a specific location, and they can "hear" USS Ross broadcasting its information from that same location, it does act as a confirmation, but if there's ever a shooting war, the first thing all the NATO ships would do is turn off their transponder - not just change their name, or pick a different MMSI. Changing the ship's MMSI doesn't hide the location of the ship from anyone; why do it? That is what I was losing my mind over. It is ultimately the commander of the HMCS Toronto who is responsible for the safety of his crew and his ship. The commander's choices are guided by directives from his superiors. What advice was provided to him from NATO? or the Royal Canadian Navy? I don't know. Did Commodore Boudewijn Boots and Cdr Martin Fluet, actually change nothing, but someone made a typo when entering the transponder number in the system? Maybe. The MMSI for HMCS Toronto and HMCS Charlottetown are only one number off. My frustration is fundamentally that it is unrealistic to think the Russian Navy, who were following SNMG2 the whole time, mistook HMCS Toronto for HMCS Charlottetown. Nobody in the world was fooled. There was absolutely no improvement made to the security of the ship, or the mission, as far as I can tell. If it was an act of obfuscation or deception it was completely useless and didn't warrant doing. If this was done on purpose, in order to deceive, what does that say about the Royal Canadian Navy's level of maritime domain awareness? Did they think it would change something? That's what greatly concerns me. If this was a typo, a major system on the ship shouldn't have typos, and at the time they left Halifax they were using the right transponder number, meaning they changed it along the way. That's disturbing. I would love to discover that this was all a ruse by the Royal Canadian Navy, and this was a repainted HMCS Charlottetown that actually transited to the Black Sea because the HMCS Toronto had much more extensive damage than had been previously reported; but I have no evidence to support that, I just made it up. Derrick cracked me up with this, and it's at least partially true. The Royal Canadian Navy, and by extension NATO, and the American DoD, I believe, need a lot of help in understanding what is or isn't effective in hiding their movements. I follow the ships I do to remind the public and journalists that we (the people) can and should track our military with the transponders they broadcast their location to their adversaries with, and are aware they are using, so we can know as much as they do. Why should the Russian Navy know where Canadian ships are, when the Canadian public doesn't? If "they" know, *you* should know. Did you hear the one about a Russian Yacht circling Puerto Rico, like a shark with lasers? Dateline November 17, 2017: The Bermuda-flagged super-yacht "Eclipse" sailed into The Port of Palm Beach Florida. Eclipse is Roman Abramovich's yacht; and he's a very rich Russian with ties to Vladimir Putin, so naturally rumours started to circulate among a faction of people, who were still in shock over Donald Trump's election win. One of the stories was about clandestine meetings at Mar-a-Lago; Russian yachts moored off the coast, and their "oligarch" owners slipped in to shore, maybe under the cover of darkness. It was a great story to lift the spirits of those who felt they'd lost the election, and helped smooth over any criticism of Hillary Clinton's election loss. The Russian yacht-clandestine meeting narrative would fan the flames of the story it was the Russians, not the American voters, who were to blame. The yacht story would also prove to be quite absurd. As reputable media organisations reported, Roman Abramovich wasn't on his yacht in Florida in 2017. That's what his publicist said. That's what the press said. Why? How can I be so sure? Because there were no helicopters, no fast cars, no entourage, no limo... and no Roman. Where Roman Abramovich goes, so does the Paparazzi. There were no Paparazzi staking out the ship, because Roman Abramovich wasn't there. Some people wanted to believe the yacht, owned by a rich Russian, was a sign of Russian influence. The yacht was parked for weeks at the end of 11th Avenue in Palm Beach, having preparations done for its usual winter season spent in the Caribbean. Unfortunately, the yacht's presence was all the evidence some people needed. Believing the yacht's owner is nearby may be a good guess for someone's weekend cabin cruiser, it doesn't scale to the mega-rich, with yachts that are the size of cruise ships. Despite the rumour not being even remotely plausible, let alone true, the story plays to a crowd who would very much like to believe Russian yachts are following the President of the United States up and down the United States East Coast, and somehow meeting with him, despite closed airspace overhead, and secret service agents hiding in the bushes. Mega-yachts of the rich and famous are not following Donald J Trump around. 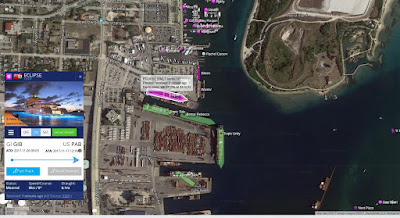 The story is quite ridiculous, and easily shown to be false; all multi-million dollar yachts have AIS transponders, all are tracked, but the rumour has staying power, because people want to believe it. It is quite impossible to smuggle a Russian billionaire into the USA using a yacht that's worth hundreds of millions of dollars unnoticed. 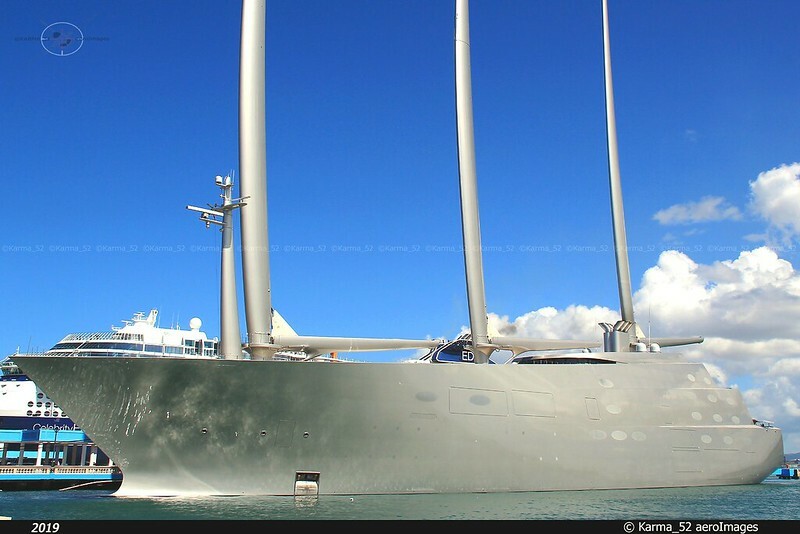 Skip ahead to April 2019, and another (in)famous Russian's yacht sailed into a US harbour, this time, into the Port of San Juan; Andrey Melnichenko's super-yacht "A" - to a crowd of impressed onlookers. Since Donald J Trump isn't in Puerto Rico (I hear he's not popular with the locals for some reason), how can this non-event be spun to be something nefarious and Russian-y? The rumour is the yacht stopped near a dozen different American military bases in Puerto Rico, the insinuation is they are conducting SIGINT/ELINT/COMINT/(etc); someone even made a list of the bases... but it's not entirely as it seems; it's a truism. Truisms make great springboards for propaganda, especially when people don't understand they're truisms to begin with. Picture a rectangular dining table, standing on four legs. In your imagination, walk around the table. Now picture the headline as; "Suspicious person seen circling 4 table legs; citizens monitoring situation for signs of vandalism." It misses the obvious, an uses exaggeration for effect; but it's still the same story, phrased differently; spin, propaganda, disinformation - whatever you want to call it. I want you to think about this. I invite you to look at a map of Puerto Rico. Answer me this; in what direction can you sail around the island, approaching from the East, and loop around the island (ending up heading East again, like a horse shoe) without passing "near" a dozen military bases? Do you sail around the island clockwise, or counterclockwise, to avoid the bases? What do other yachts do? What's is the baseline from which you determine that this trip is at all unusual or out of the ordinary. I hear Puerto Rico is lovely, but it isn't very big. All of the military bases are close to shore if not on the shore. No matter where you are in Puerto Rico, you're already near a US military base. Even using terms like nearby and close are subjective, and could be an attempt to make the claim impervious to criticism. These are the usual wiggle-words that we, the consumers of propaganda, need to be on-the-lookout for. Additionally, the claim doesn't elaborate regarding the speed or where the ship stopped; it is only referred to as circling the island, and stopping near bases, which is true, they did sail around the island counter clockwise. If they had sailed around the island clockwise would that have avoided scrutiny? My point in pointing out the absurdity of these allegations is they're totally baseless. As a truism those that make the claims can say they're factually correct; and they are. 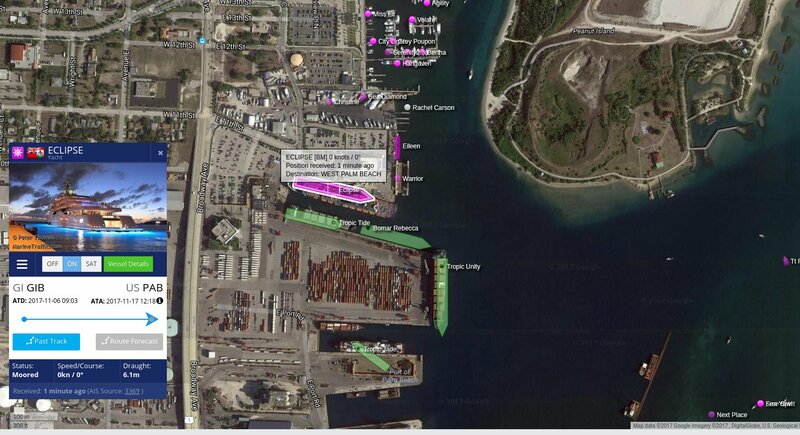 There was a big yacht, owned by a Russian (not a Russian yacht - there's a difference), that sailed around the island of Puerto Rico, as it had previously done around many other Caribbean islands. There's nothing weird or nefarious about it. It's the same route taken by millions of other ships before them, and completely unrelated to Venezuela; which is a new red herring that could have been thrown in by the Venezuela regime change propaganda campaign for all I know. Using MarineTraffic.com data of the ship's movements shows their pattern of movement matches what you'd expect the route would be for any incredibly expensive yacht; they're sailing from beach to beach, Caribbean vista to Caribbean vista. 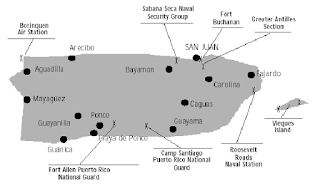 Overlaying that they're stopping near American military bases is true, but only because Puerto Rico has so many military bases; it's a truism. 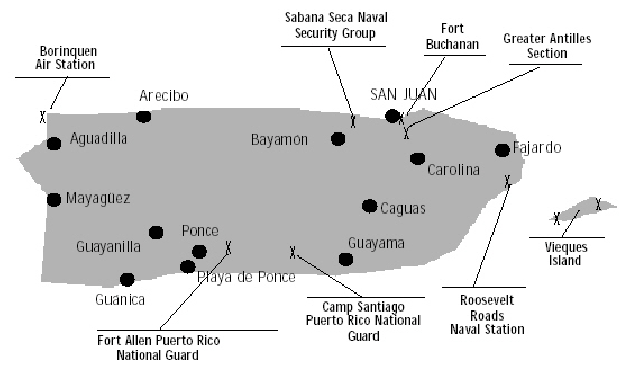 Every ship that circles the island or stops anywhere near Puerto Rico is "near" a military base. 2019-01-26: NORAD intercepted two RuAF long range aviation Tu-160 bombers over the Arctic. On January 26th 2019 Russian Air Force Tu-160 bombers took a spin around the Arctic and drew out a welcoming party of two F-22s and two CF-188s; NORAD announced the incursion into their self-assigned "Air Defence Identification Zone" or ADIZ for short. The ADIZ is international airspace, but serves as a buffer where unidentified or suspect planes are intercepted, to make sure they don't get too close to Canada or the United States in case they have hostile intentions. 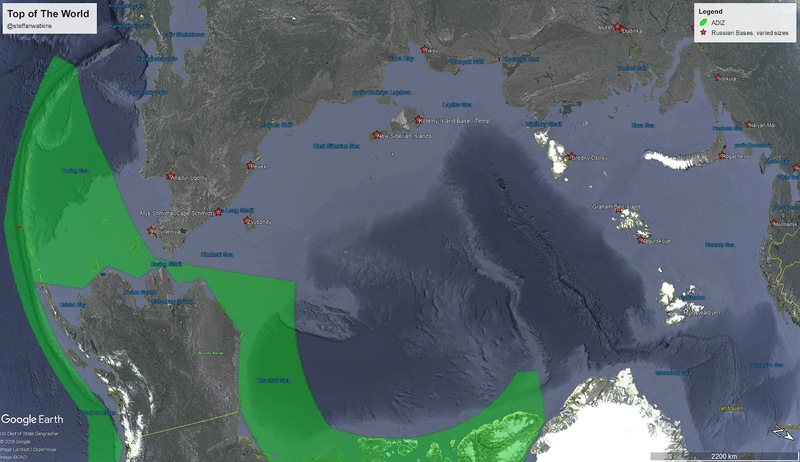 While too close is subjective and the ADIZ arbitrary, potential hostile aircraft should be intercepted before they are within sovereign airspace, which only extends 12 nautical miles out to sea. An E-3 Airborne Early Warning and Control System, two F-22 and two CF-18 fighter jets from the North American Aerospace Defense Command positively identified two Russian Tu-160 Blackjack strategic bombers entering the Canadian Air Defense Identification Zone on January 26, 2019. NORAD employs a layered defense network of radars, satellites, and fighter aircraft to identify aircraft and determine the appropriate response. The identification and monitoring of aircraft entering a US or Canadian ADIZ demonstrates how NORAD executes its aerospace warning and aerospace control missions for the United States and Canada. Here is a summary of the facts, derived from the original text displayed above, which you won't see on Fox, VOA, or Axios. These are the facts conveyed by NORAD themselves. Anything beyond the above details you just read came from somewhere other than two public official NORAD statements; one Saturday (Twitter), and one Monday posted to the NORAD web site. Did the journalists speak with NORAD? Did they say so? Did they cite their source? If not, they may have made it up, or maybe their editor made it up. Call them out for it. 2 RuAF planes were "Positively identified" by NORAD; which suggests they intercepted, then flew alongside the RuAF Tu-160s, which were always in international airspace, for a period of time, until they were satisfied they were not a threat. However, I'm extrapolating my understanding from what little they said. 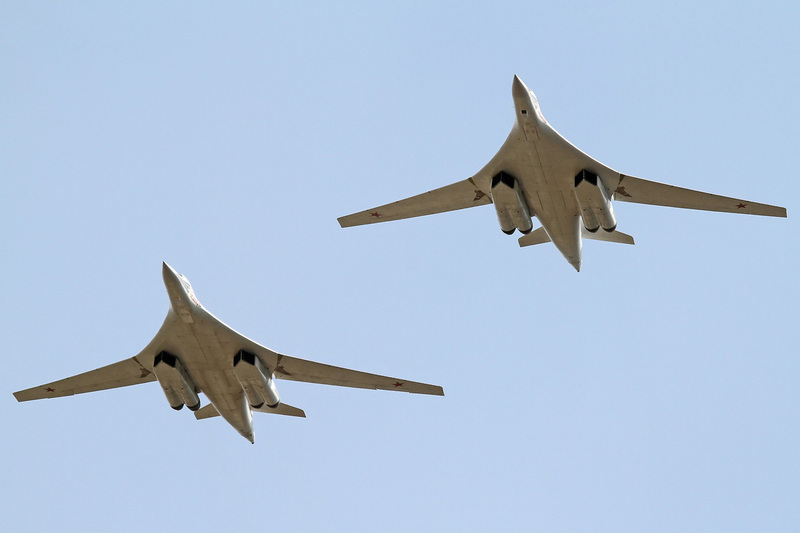 2 RuAF Tu-160s were "positively identified" in the ADIZ by 4 NORAD fighters. That is the whole story. Additional USAF refuelling aircraft were likely providing gas to NORAD thirsty travellers, but that is unconfirmed. It is unlikely all four planes were escorting the Tu-160s the entire time. There would likely have been a "hand off" from one pair to the other at some point. "Russian bombers buzz North American coastline" was coined by Lucas Tomlinson (@LucasFoxNews) and Fox News producers. I can't say that a NORAD person never said those words to Lucas and his editor/producer, nor does Lucas claim they did, or quote them - someone editorialized what NORAD said. However, the statement is unlike anything I've ever heard from anyone at NORAD I've ever spoken to. "Buzzed" would imply proximity to the shore or "coast". NORAD's statement specifically said they had not entered sovereign airspace, which extends 12 Nautical Miles from shore; so factually, citing NORAD, I can tell you they were not "Buzzing" the coast, and that Fox has deliberately mis-characterized the flight for the sake of sensationalist reporting; for propaganda even. Unfortunately, other media outlets and bloggers jumped on this "coast" narrative and made it the news of the day, regardless of the facts. I hope journalists and editors realize they were used by partisan politics in propagandizing the routine flight in international airspace and will be more wary next time, but have little hope that will be the case. ~4 hours before NORAD tweeted about the intercept, the Russian Military TV Channel "Star" broadcast the Tu-160 story, from their point of view. "Два стратегических ракетоносца Ту-160 выполнили плановый полет в воздушном пространстве над нейтральными водами акваторий Северного Ледовитого океана, Баренцева, Лаптевых и Карского морей. Продолжительность полета составила более 15 часов. В ходе полета экипажи Ту-160 отработали дозаправку топливом в воздухе." "Two strategic missile carriers Tu-160 performed a planned flight in airspace over the neutral waters of the Arctic Ocean, the Barents, Laptev and Kara seas. The flight duration was more than 15 hours. During the flight, the crews of the Tu-160 worked refueling in the air." "Плановый полет прошел над нейтральными водами акваторий Северного Ледовитого океана, моря Лаптевых, а также Баренцева и Карского морей." "The scheduled flight took place over the neutral waters of the Arctic Ocean, Laptev Sea, and the Barents and Kara Seas." 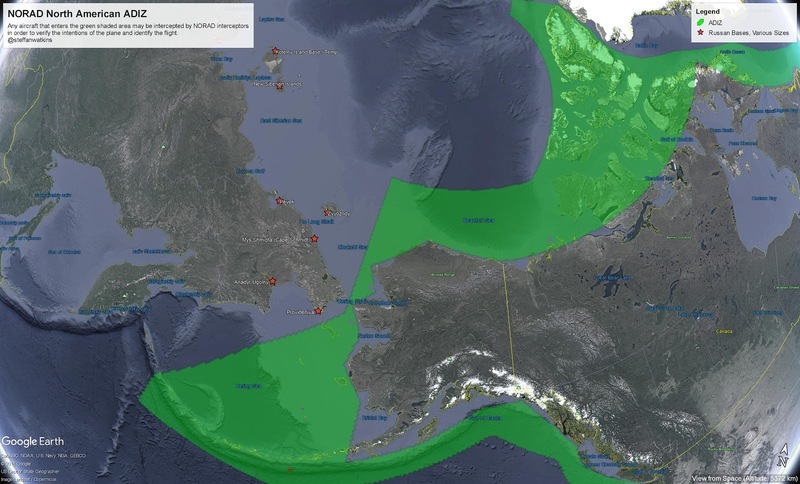 "An E-3 AWACS, 2x F-22, 2x CF-18 fighter jets from NORAD positively identified 2x Russian Tu-160 Blackjack strategic bombers entering the Canadian Air Defense Identification Zone on January 26, 2019. Bombers remained in international airspace and did not enter sovereign territory"
"Опубликованы кадры ночной дозаправки Ту-160 над водами Арктики"
"(Zvezda) Published footage (of) night refueling of the Tu-160 over the waters of the Arctic"
"Пять военных самолетов США и Канады подняли по тревоге из-за Ту-160"
"Five military aircraft of the United States and Canada raised the alarm because of the Tu-160"
Whereas TV Zvezda is the Russian military TV network, and usually provides original Russian-sourced information, Sputnik usually mirrors what is being broadcast in the United States with an alternative view from a Russian angle (mileage may vary); take this post which could have referred to Russian sources, but instead reported on American sources in English, and added what sort of weapons loadout they could have (not what weapons they *did* have, because all indicators point to the plane being empty). "An E-3 Airborne Early Warning and Control System, two F-22 and two CF-18 fighter jets from the North American Aerospace Defense Command positively identified two Russian Tu-160 Blackjack strategic bombers entering the Canadian Air Defense Identification Zone on January 26, 2019." I think it's quite possible they intentionally schedule the flight when they expected the least response from NORAD Public Affairs and he public; my impression is these get more coverage on weekdays rather than weekends. I could be wrong. Unfortunately, unlike the Japanese Maritime Self-Defense Forces who post a summary of Russian air movements in their air-defence zone, NORAD does not give us any context where the flights took place. This obfuscation is said to be for "Operational Security" reasons, but I don't quite understand that, since we're referring to Russian planes who know they were intercepted. Japanese Joint Chiefs of Staff Press Release (via Twitter) including map of Russian operations near Japan; you've never seen anything like this issued by NORAD because they've never done so. I can't see why NORAD would seem to feel releasing the above Japanese-style map would compromise national security, but it would greatly improve the understanding of NORAD operations for the public at large, and neuter any attempts at disinformation efforts that would portray the event as something more than it was. This is a screenshot of OpenStreetMaps which shows you the 12 nautical mile limit as a thin purple line. Please note that between the coast of Russia, and the line; that's Russian airspace. Between the Alaskan coast and the purple line; that's American airspace. That's all of it; 12 Nautical Miles. It's not very far at all, especially by plane. Here we have an FAA-data driven Google Earth image showing the ADIZ. If a Russian Air Force plane flies through the green zone shown below, NORAD may send an interceptor to say Hi. They might not. The idea is to keep the Russians guessing regarding when and where they are detected by coastal radar or other national technical means. Did they, or didn't they see them flying by? You'll notice that the ADIZ is mostly over international waters, which is where you'd need to be to intercept a Russian bomber, before it unloads ALCMs at CONUS; that's the idea anyway. Exactly where the Tu-160 took off from and landed was not published, but they did say they travelled over the Arctic, Laptev, Barents, and Kara Sea - and always in international airspace; which is easy to do, since it's all international airspace past 12 nautical miles from shore. I can hope that someone at NORAD sees my butchery of Google Earth maps / the ADIZ and demands they publish better maps so they never have to be subjected to my graphics "prowess" again. Unfortunately Lieutenant-General Sergey Kobylash, the commander of long-range aviation of the RuAF isn't a Twitter guy, so I don't think I'll be able to ask him any specifics on the mission, but here are the videos they published of the flight (the same flight) as NORAD announced. You may not be aware, but NORAD has no obligation to Canadians or Americans to tell us every time they perform one of these interceptions; they only release the information if the Russians publish something about it, or if someone at the Pentagon leaks it to the press, forcing their hand. As an aside; it sure would be nice to get 1080p or 4k NORAD footage, wouldn't it? The news media routinely make the same mistakes, with clickbait headlines about intrusions into North American airspace, every single time one of these flights takes place, but NORAD every single time diligently tells the public no national airspace was crossed, and the bombers were never in sovereign airspace. Why editors and producers of the news ignore this can only be because of clicks, because it certainly isn't from being accurate. Kudos to you journalists who didn't fall for the "buzz the coast" narrative, and a finger wag to those of who who spread the story in that "Fake News" light. Thank you to the mystery person (and people!) who are monitoring the Russian HF radio networks the bombers talk to each other (unencrypted, old school, voice comms) while performing operations, live tweeting it for the world to read as it happens. I completely missed this thread on Twitter, and several side-bar threads of people I follow, and who follow me on Twitter; so I profusely apologize to them for not noticing and not including the information they had put out there while the action was going on. We knew the Russians said they were doing refuelling up over the Arctic on their 15 hour training flight, but now we know the composition of that effort. That's a pretty impressive sortie, I'd say. The public's ability to use OSINT to track planes should not be underestimated by the RCMP. At least one RCMP surveillance plane, believed to be outfitted with electo-optical night vision and thermal sensors, circled ~6000-7000ft over Kingston for almost two weeks in January, keeping residents awake, annoyed, and curious, all night long, while they were investigating a National Security case in Kingston. It turns out the noise was from at least one nondescript, primarily white in colour, Royal Canadian Mounted Police Pilatus PC-12, registration number C-GMPB, ICAO Hex C065E0, and a serial number of 1304. C-GMPB departed London Ontario on January 4th headed toward Ottawa. On January 4th a local Kingstonian PlaneSpotter, Neil Aird, heard the plane, and checked his own ADS-B/Mode-S transponder receiver to catch the tail number as it flew overhead and around Kingston. The same plane seemed to head home on January 7th, then back towards Ottawa January 8th, operating in the area until January 15th when the plane was flown back to Southern Ontario, to the Division "O" headquarters, but not before getting photographed by Neil on January 14th. I speculate the jaunt to London Ontario could have been a crew change, or something similarly practical and mundane. Let's check in on the capabilities of the plane, which are naturally not mentioned by the RCMP. For cost savings, I suspect the plane is COTS, so we can refer to the marketing material around the two or three PC-12 "Spectre" variants the RCMP purchased. The last official number I could find was two, but I think more have been upgraded/converted or delivered since. 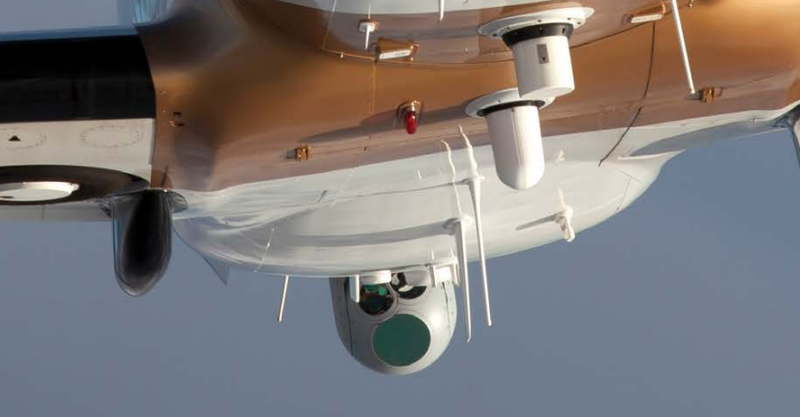 The plane would have been outfitted with the top of the line IR/Electro-Optical and Thermal sensors. Here is their brochure; in short, they'll kit it out with whatever sensors you want, or leave you the hook ups exposed so you can customize it yourself. Glossy: here. Below we have a sister-plane to C-GMPB taking off from Ottawa International YOW/CYOW in 2018. Notice the paint scheme is different from older RCMP planes with rainbow racing stripes. Here is another sister-plane to the aircraft that had been circling Kingston, on and off, from January 4th to January 14th, 2018. Notice the paint scheme; not the usual RCMP colours. Singled out as being the only single engine plane circling for over a week over a city makes you "overt", not "covert". Kingston has ~125,000 people, and more than a few noticed the RCMP was circling overhead and kept them awake all night for days; that's overt, not covert surveillance. I was contacted by a couple of people in Kingston who'd seen me written up previously (here, here, or here), but I really didn't think there would be such a paper trail for an RCMP surveillance aircraft, I thought they would have been super-stealthy. I guess not! Even before we knew the tail number from Neil's work, the plane operated all night long, that's a very specific behaviour. I ask you rhetorically, who else would possibly be flying, at 3 am, over Kingston in the cold. I live near the Carp Airport (CYRP) and twice a year helicopter pilots get re-certified for night operation or some other paperwork. They fly helicopters over the neighbourhood until ~10pm, and then go home - because they're human and have families to go home to. There is no activity, other than LEO, that would keep employees circling that long at that time in that pattern. I speculated it could be something corporate, doing some sort of survey,... but realistically, no. It's really likely any circling plane at 3am over any town of 125k people is some variety of LEO; local, provincial, national, or border services. The plane was circling for hours. Again, this is a behavioural tell. Take an example.. Sightseeing biplanes take off from CYRP; depending how much you want to spend, you can get a short tour, or a long tour of Ottawa. Either way, you're taking off from CYRP, flying around, and returning during the daytime, within a short-ish period. Minutes, not hours. There isn't anything that would justify circling for hours and days on end. The pattern of the plane's movement, the time, the altitude, this all paints a picture, but I still don't know why a white van parked across the street (yeah I know it's a movie trope) wouldn't be sufficient? SURE the plane is nice, but was it necessary? I don't know. That's past what I can realistically criticize, since they won't say why they needed the plane to begin with (even after today's 1pm press conference). Initially many wondered if it could have been military? With CFB Trenton so close, it seemed like it could have been, but Trenton has a transport squadron, and while there are other people who I'd rather not mention in the area, none that would do reconnaissance from a small plane that fits that description, that I'm aware of. I liked the idea they were testing a drone's optics or something, but that didn't pan out either. Early distant photos of the plane showed it was a small plane, that looked like a PC-12, but was not confirmed at the time. On January 4th the public (Neil in this case) knew that an RCMP operation was going on from the noise coming from their not-so-covert platform circling at < 7000ft for hours at night, by checking for the closest transponders that were beaconing in the area. The operational security implications of this are huge, as organised crime could easily look for all RCMP planes' presence in the future. I'm sure there are reasons why Mode-S has to be used, rather than being turned off entirely, which gives away the location of the plane, but shouldn't there be something they can do? Use a different mode? Neil is one of the good guys, and expecting the bad guys to not notice an RCMP plane circling overhead when they can precisely triangulate their position with < $1000 of computer gear bought off Amazon. Why am I bringing all this up? Because nothing changes if you leave it alone. The RCMP is performing surveillance with a plane that's (figuratively) screaming "HEY! I'm with the RCMP and you're within line-of-sight of this transponder that's on a plane overhead, else your laptop wouldn't be able to hear me! ", over 1090 MHz, over and over, as it circles all night long, if you're listening. I believe this was a good use case for why the RCMP needs a Predator-sized drone, which could fly higher, see farther, and loiter longer - drones don't eat or sleep. If the plane hadn't been noticed from its sound, nobody would have looked it up and tried to piece it together with relatively easily available present hobbyist technology. Here's Global News talking with Neil, who's really the Plane-Spotter hero of this story, in my opinion. Also, the title of the report should be "MYSTERY SOLVED!". Neil nailed it, and Steph Crosier first reported it in The Whig January 22nd 2018. The Canadian Forces may be ignoring a nuclear waste problem they may have in Goose Bay. Fissile pit storage buildings were unique in US military architecture. US Strategic Air Command "Special Weapon" design (until the early 1960s) had removable fissile pits, and once sealed pit weapons were fielded, the maintenance intensive "open pit" weapons were withdrawn, stockpiled, and decommissioned. A sealed pit is maintenance-free and allows the weapon to sit idle, without routine maintenance (polishing) while deployed at an Operational Storage Site. 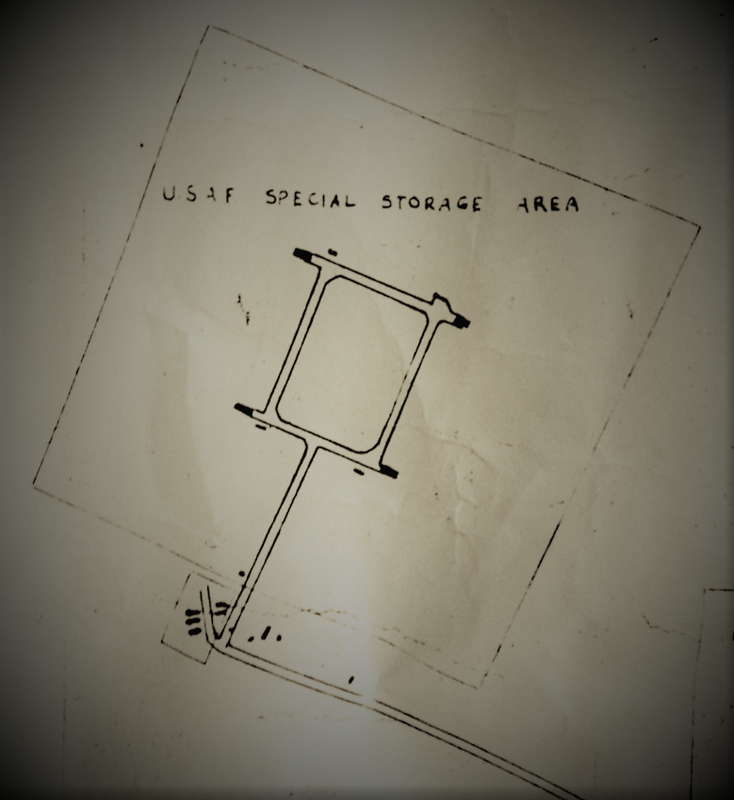 Vintage site plans of Goose Air Base show the pre-1954 weapons storage site in the woods at the Northwest end of the base, and it is labelled "USAF Special Storage Area". You may recall nuclear weapons of the time were referred to as "Special Weapons". There are the ruins of a dog kennel, guard buildings, and laboratories for the maintenance of the bomb by technicians on loan from Sandia National Labs, and double barbed wire fences.The fences have been kept up, since the base still uses the area, and are lately using it for a firing range. If no maintenance was ever going to be done at the 1950-1954 labs in the woods, there would be no reason to build a "lab" right beside the Operational Storage Site. It's also possible that they built the lab in case they had to perform maintenance, but never did. All activities involving nuclear weapons were, and are still, highly classified matters of national security. Unlike common knowledge about where the local drive-in theater was in the 1950s, very few people knew anything about nuclear weapons maintenance / operations who lived nearby, unless they had a need to know. From reviewing hundreds of pages of documentation from 5 Wing Goose Bay, and Parks Canada, regarding the former Strategic Air Command Weapons Storage Area at CFB Goose Bay, nobody has any institutional knowledge about the 1954 and 1958 Weapons Storage Areas built specifically to store nuclear weapons, or what came before them. What will satisfy me that the Canadian Forces have taken this seriously and done all they can do to prove there is absolutely no nuclear waste buried near where the United States stored "The Bomb" between 1950 and 1954? I'd like a survey for Alpha ( α ), Beta ( β ) and Gamma ( γ ) radiation to be performed with the aid of the United States Corps of Engineers, who have dealt with these sites many times before, and considering it's their mess, I think its appropriate to drag them back to Goose Bay to take a closer look at what they left behind - IF they left anything behind. The low-yield waste that would have been left behind would emit Alpha and Beta radiation; the risk to the local community would be slight. All the same, I would like the Government of Canada to be 100% confident that when the Americans pulled out of Goose Bay they only left a nightmare of hydrocarbon contamination, and not radiological contamination too. The United States keeps quite good account of where their nuclear weapons are, and where they have been. All nuclear weapons and weapons assemblies have serial numbers and can be traced through their life cycle. Canadians do not know when and how many nuclear weapons were in Canada, and for how long. Ultimately I would like a complete account of every single nuclear (and non-nuclear) weapon that has been transported in Canada, including US-leased bases, with their serial numbers. If there were no fissile pits from 1950-1971 (with a focus on 1950-1954) in Goose Bay, then there is no way there could have been low yield nuclear waste there, and it would save everyone a lot of time knowing that up-front.